“Brad and Kendra are awesome. Their attention to detail and to their client needs is unsurpassable. We purchased a historic farm house that was completely gut renovated and needed to be designed and decorated from top to bottom. Brad and Kendra took on the project with such enthusiasm and respect for our style and the historic nature of the house. Each room came out beautifully and we couldn't be happier. The renovation was even featured in Design New England Magazine and Boston Home Magazine. We would recommend Color Theory Boston in a heartbeat!” - Janet H. : Medfield, Ma. “We think Brad and Kendra bringing Chris Barra(General Contractor) to us was a huge feather in their caps, and we were very pleased with the process and the outcome. Additionally, Mark Brunke’s (Master Carpenter) work has been fantastic. It is very difficult to find professionals whose work is top notch, and who are people we feel comfortable having in our home for extended periods of time. I give Brad and Kendra credit for bringing us good people. We love their work, we respect their opinion, and we hope to have the opportunity to work with them again the next time we’re crazy enough to embark on another project.” - Ed K. : Milton, Ma. "My husband and I recently purchased a 2500 Sq Ft home in Cambridge and were looking for assistance with a color palette. We received a glowing recommendation from my parents, who had used Color Theory Boston a couple of years ago for their home in Scituate. We loved the transformation in their home and decided to contact them. From the first moment of communication, Brad was extremely professional, personable and knowledgeable. He quickly fit us into his busy schedule of appointments, visited our new home, and had a proposal to us in a matter of days. It was fabulous and included many elements that we would have never have even considered. Brad not only created an amazing flow from room to room, but proposed a palette in each room which beautifully accented the furnishings. The transformation is truly stunning, which included painting our dated yellow kitchen cabinetry to a crisp and modern white! What is also incredible is that Brad is not only the designer but also involved in the actual painting and final results, supervising his skilled and professional paint crew. He is incredibly passionate about his work and will stop at nothing less than perfection. We would highly recommend Color Theory Boston - I can't imagine finding anyone who could equal Brad's talent, passion, service and results!" -Kim C. : Cambridge, Ma. “We called on Color Theory Boston before painting the entire interior of our house. We didn't have the time or energy to stress over seemingly limitless paint options and wanted someone with a keen design eye who could push us past our comfort zone. Brad instantly "got" what we were going for and chose wonderful colors based on our aesthetic and each room's lighting conditions and decor. He had some terrific, outside-the-box ideas that we never would have thought of. We really enjoyed working with him!” - Amy P. : Winchester, Ma. "I had struggled for a while to figure out how to transition my Boston loft from it's 7 years of very vibrant Caribbean colors to a more neutral vibe without losing some of the color I love so much. Enter, Brad and Kendra Dufton! What a team. I was a bit timid at first about letting someone else into my world since I fancy myself as a student of color and design. I worried that their tastes would not blend with mine and I would end up with a big bill for nothing or a compromise that didn't work for me! That definitely did not happen! First of all, Brad and Kendra are very, very easy to work with and they understand that their customers bring opinions to the table, too. And you quickly realize that Brad is a color wizard! He really has a sixth sense about what works and what doesn't work in a space. And since Brad paints all of the spaces that he and Kendra help create and decorate he has had a great deal of first-hand experience with many of the colors you may choose. Brad and Kendra also have been great at sourcing additional key pieces for me and referred me on to a furniture designer who has been great to work with as well. They really are a full-service company with a lot of talent. By the way, they are very reasonably priced and interacting with them is a pleasure. You won't be disappointed!" - Carole B. : Boston, Ma. "I hired Brad and Kendra to give my home in Newtonville a face lift. I told Kendra over the telephone that that we did not plan on staying in our home for more than five years so we wanted to make changes but not big costly ones. She got it. They arrived at our home and I could tell by the way that Brad was looking around that he immediately knew exactly what to do. We went through what we had in the house and made some decisions on what would remain and what would be eliminated. Within a day Kendra sent me an email with pricing and examples of boards they had created for other clients. Two weeks after our initial meeting, they came back to the house and presented two layouts with samples for rugs, fabrics, paint, etc. We spent a few hours and moved around some furniture until we came up with a plan. At first I was a little hesitant to go with some of their recommendations, (they were bolder then I would have chosen), but Brad said 'trust me this is going to look great". The makeover started with Brad and his patch & paint team doing an amazing job on the surfaces and the choice of colors was spot on. After a whirlwind shopping trip with Kendra and Brad, reupholstery and savvy art placement, voila our house was reborn. Brad was so right! We love everything!! Besides a great job at a super value, the team of Brad and Kendra are an absolute pleasure to work with. They have impeccable taste and are so creative in their ability to mix pieces from various centuries with exquisite fabrics and tie it all together with the perfect accents. We can't wait to work with them again." - Gina C. : Newtonville, Ma. "I discovered COLOR THEORY when I received my monthly subscription of Boston Home magazine. I viewed their website and loved their portfolio! I called and left a message, Kendra promptly returned my call and we scheduled a Color Consultation. When Brad and Kendra came to take a look at my home, I knew instantly we would work well together. I informed them the scope of the work which was to update my two children's rooms to reflect their personality, style and interest. I loved their ideas and before you knew it, I wanted to see what ideas they had for the rest of the home. When I received my Quote via email, I asked them if they could "cut me a deal" to redo the whole house instead, and they delivered a more than fair Total. The work began 3 weeks after our initial consultation and it lasted about 2 1/2 weeks. I was amazed at the time line and was skeptical at first, but Brad assured me that it would all be complete on time, which in fact it did. "Brad and Kendra were fun, professional, and easy to work with. Brad immediately knew what paint colors would make my very small condo seem light and open, I couldn't be more thrilled with his choices, it's exactly what I was wishing for. Kendra's choices in fabrics, bedding, furniture, and layout were just perfect, very thoughtful choices. Brad and Kendra were such a pleasure to work with, I would definitely recommend them!" - Nicole R. : Boston, Ma. "Based on a family recommendation and their portfolio, my wife & I hired Brad and Kendra to design and repaint/wallpaper the foyer, kitchen, and nursery, and repaint the bedroom in our 800 sq. ft condo in Cleveland Circle. They were extremely flexible in adjusting their project plan and estimate to fit within our overall budget, and kept focused on "bang-for-buck" when suggesting design & decor options. Working with them could not have been more pleasant; both Brad and Kendra were personable, attentive, professional, and EXTREMELY generous with their time, effort, and resources. We are very pleased with the quality of the work as well. Loved their aesthetic going in, and they showed both inspired design and a good understanding of what our sensibilities were. The execution of the paint and wallpaper in every room was also spot on. Great folks, great work, highly recommended." - Mike S. : Brighton, Ma. "Having been denied by a few painting companies because of the 16 foot walls in our loft, my husband and I were skeptical we'd find a paint and design team willing and able to paint and wall paper our space. Luckily we were referred to Color Theory Boston by a free lance painter friend , (who was also unable to work with our space), who knew their reputation and abilities. Brad, at Color Theory Boston, not only accepted the challenge of our space, but he surpassed our expectations. We had an idea of what we wanted for the space, but not the refined eye to put it all together. Upon a color consultation, Brad selected the paint colors and the wall paper based upon our style, our furnishings, and personal lifestyle. And his selections were spot on. All in all, he painted our loft with 16 foot walls, including a 16 foot stair case, 2 bathrooms, and a kitchen ceiling with exposed beams, wall papered a 16 foot wall, and painted railings within the loft. We also had art pieces we were unsure of what to do with. He knew exactly where, and how, to hang them within our space to get the maximum wow factor. Color Theory Boston will absolutely get a call from us in the future with home design projects. I thank them for seeing our vision, and for making it happen." - Kerry G. : Boston, Ma. "Color Theory Boston deserves five stars for their spectacular talent and expertise which our family saw over the last few month as they worked with us on our home in the South End. It was a pleasure to work with them on a personal level, as they are lovely people, cheerful and professional at all times. Their expertise was amazing, basically turning our brownstone into a "real" home, both comfortable and stylish at the same time. While working, Brad and Kendra were very accommodating of our routine as a family with 2 children. Our routines and family culture were also noted even when designing the scheme of our home! We recommend them fully, and would work with them again on any future home! Thanks Brad and Kendra!" - Skyler J. : Boston, Ma. "We have happily hired Color Theory Boston twice in the past year. The first time was to hang our Osborne & Little wallpaper in the master bedroom. They worked quickly, cleanly, and efficiently. The finished result looks fantastic. After that project, we turned over our entire place to Brad for a complete paint make-over. Brad designed a complicated interlocking stripe pattern for the entrance way using three colors of paint that he then incorporated throughout the apartment. We live in a loft building, and Brad used paint in surprising ways to accentuate the unique structural characteristics of our place. He fearlessly painted columns and ceiling treatments, and with great joy, we watched our place spring to life.We have hand painted birch trees along the walls of a newborn nursery. The trees are stunning and have an urban-camouflage feel. Brad also interspersed hand-painted orange birds on the branches, symbolizing the 5 family memebers. You have to see it to believe it! All told, Color Theory Boston repainted our entire loft space in just under 2 weeks. They moved and replaced furniture and wall hangings as needed and kept the place extremely tidy after each day of work. The project even finished ahead of schedule, and along the way several neighbors stopped us to comment how courteous and professional the Color Theory Boston team was to everyone they came into contact with in the building. Beyond their obvious artistic talents, Brad is genuinely a nice person and knows how to listen/interact with clients. I can not recommend Color Theory Boston highly enough!” - Dayna G. : Boston, Ma. "I'm currently midway through a job with Color Theory Boston (redoing our living room and kitchen.) So far, very happy! From the first meeting I felt a really easy connection with them. They're very professional, but also easy to have in your home. And face it, when you have people painting, and wallpapering and spending time in your home, it's an extra bonus if they get along with the kids and the dog and are pleasant to be around. Both partners bring their own areas of expertise to the design process and they compliment each other's strengths. After our first meeting, they came up with a plan to work from. As we've gone along, they really listen if I need to bounce ideas or modify the original plan. They are not interested in up-selling you out of your budget, but will help you come up with a beautiful design that fits your budget. As I said, we're midway through the job, and I have nothing but praise." - Martha L. : Marshfield, Ma. Color Theory Boston for both their amazing consultation and advice, as well as great workmanship." - Danielle K. : Boston, Ma. "What an absolute pleasure working with these guys! I'm currently in the middle of a multi-phase project that includes paint and wallpaper. The process has been a fun and fluid creative exchange at every step. Brad delivered everything he promised. I'm looking forward to our ongoing collaboration these next few months. I cannot recommend him highly enough." -Jill C. : Boston, Ma. 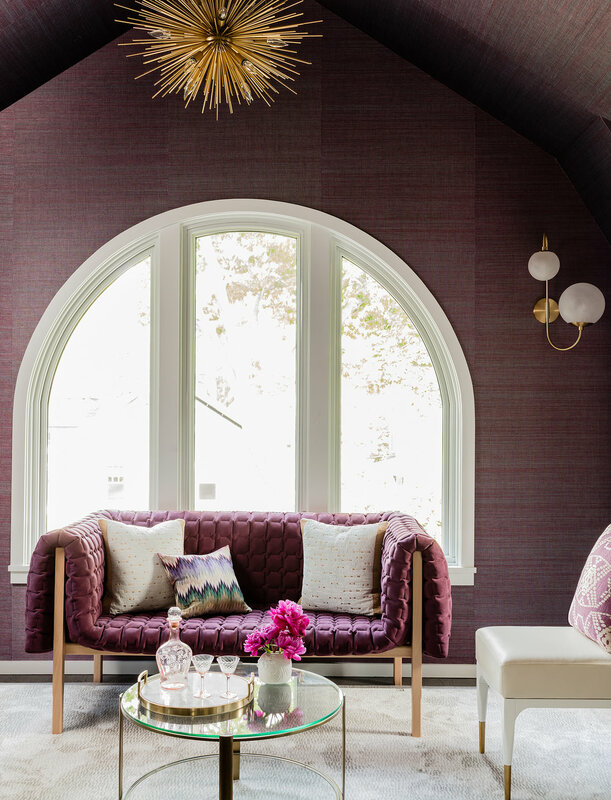 "We initially hired Color Theory Boston to do a color consultation for our new house. The home's previous owners had very different taste than we do, and we felt that it needed a fresh look. From the very moment that we first met with Brad and Kendra in our house, we knew that they were the right people for the job. They listened carefully to what we were hoping for, asked great questions, took a thorough survey of the house, and ultimately came up with a palette for the entire home. They even talked made some suggestions for a few spots where we could use wallpaper-- something that we had never considered. And their suggestions could not have been more perfect. The effect was classic but fresh, modern but warm, cozy but bright. We were thrilled. We asked them to give us a quote for doing the painting as well, and were thrilled again-- it was significantly lower than any of the other quotes that we received. A few weeks later Brad and his team came to start the painting and to hang the paper. We were amazed by the job that they did. In just over a week, they repainted or repapered the entire home-- floor to ceiling. They even went out of their way to fix existing problems that they weren't contracted to do. They were meticulous, did beautiful work, arrived on time and left the property cleaner than when they arrived each day. They were even lovely to our small children, who were often wandering in and out of paint cans and ladders while they were trying to work. The process was quick and painless, and the results were absolutely breathtaking. Suddenly, our house was feeling like home. We moved in to the home a few weeks later, let the dust settle (literally and figuratively), and then started to imagine other ways that we could use Brad and Kendra's talents. Within a few months, we hired them to help us with interior design for a few of the spaces in the home that needed some reimagining. Again, their quote was low. REALLY low. So low that we added a few more spaces. Before we knew it, we had hired them to design almost every room in the home-- for less than we had anticipated paying for the original spaces. And, again, their product was incredible. They immediately understood what we were hoping to achieve for each space. They took all of our requests into consideration-- using child-friendly designs, repurposing furniture that we already had. They came by a few weeks later with three possible storyboards for each space. And our biggest concern, honestly, was how to choose. Each was more exciting than the last. We set the wheels in motion, and could not have been more happy with the outcome. It is now almost a year later, and I can honestly say that we could not be more thrilled with the work that Color Theory Boston has done in our home. Over the course of a few months, Brad and Kendra designed beautiful rooms, accompanied us on shopping trips, placed orders, made literally hundreds of perfect suggestions (it was not uncommon to receive a text or an email on a Sunday afternoon with a photo of a recent find), thought and rethought specifics as our requests shifted a bit, oversaw the delivery and installation of the rooms, and basically transformed our home from top to bottom. Even now, they'll notice things that they think might be a great addition, and bring them to our attention. We could not be more excited about the results. We get compliments every day on the design of our home. And, more importantly, we love living there. The home is distinctly "us", just far more perfectly laid out than we could have ever done on our own. There is not a single piece of the home that we don't love, or that we feel isn't right. Brad and Kendra made sure of that. I'd also like to mention that, over the course of this experience, it has been an absolute pleasure getting to know Brad and Kendra. They are truly lovely people, kind, generous, warm, and unendingly creative. We are only disappointed that we've run out of spaces in our home for them to help us transform.